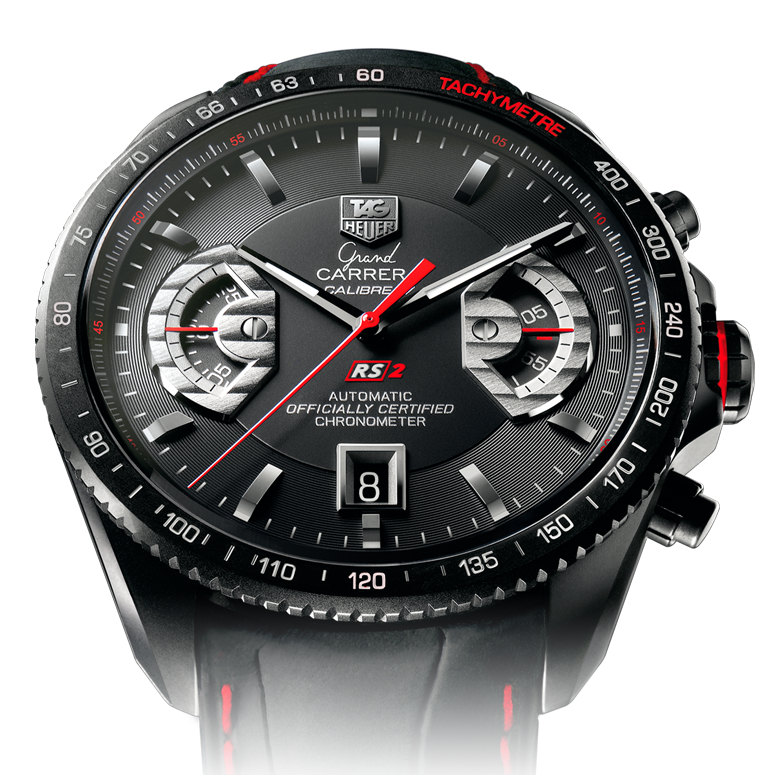 It’s no wonder the TAG Heuer Grand Carrera CAV518B.FC6237 has been compared to the Ferrari of watches. With its distinct black and red color combination, this is a timepiece that oozes masculinity and power. The case of the watch is black PVD titanium as is the bezel. The large face of this watch makes it immediately noticeable, but the titanium construction makes this watch light and exquisitely wearable. This watch features a black, two tiered dial with luminous, silver-toned hands and hour markers. The chronograph features of this watch include a small seconds indicator at the 3 o’clock position, and a small minutes indicator at 9 o’clock. Both are imbedded within steel-rimmed semi-circle windows. The dial also features a date window at 6 o’clock. The bracelet is black matte leather in a crocodile print with red stitching. It fastens with a deployment buckle clasp. 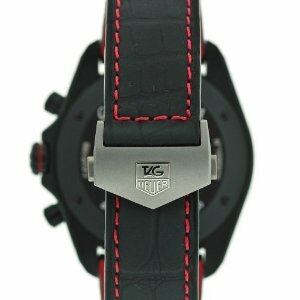 The red stitching on the wristband is echoed in the red detail on the crown, making this a watch with an overall look that ties together seamlessly. It’s important to note that this timepiece is automatic, meaning that it runs on the movement of the wearer’s arm. While the watch should remain relatively accurate, it is normal for automatic watches to lose a few minutes a day. 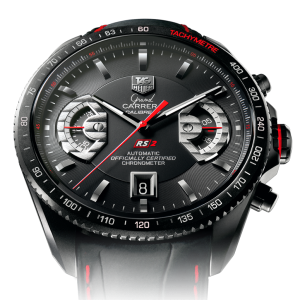 However, this alteration in speed should not affect the chronographic aspects of the TAG Heuer Grand Carrera CAV518B.FC6237, mainly as a result of the fact that stopwatch functions of this watch only last up to 30 minutes. Eventually, like all automatic watches, this timepiece will cease to run without being worn. However, it does have a power reserve of approximately 42 hours, so you could potentially own this watch without having to purchase a winding box as long as you remembered to wear this watch every couple of days. All the watches in the Grand Carrera series are automatic chronographs, and as such they all come equipped with the same basic features, however there are a few variations of this timepiece. For example, there are watches with this same color scheme but whose wristband is made of rubber instead of leather, which may suit a sportier look. There are also other color schemes and dial arrangements, so if you know you want a TAG Heuer Grand Carrera, there should be a style that’s perfect for your needs.